Today I am thankful for maturity. Maturity is one of those things that is easily noticed but hard to obtain. 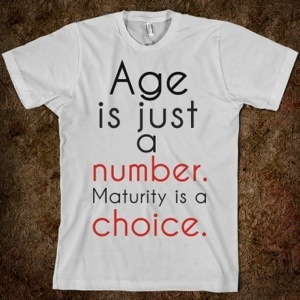 Attaining a certain age does not automatically make you mature. Neither does merely amassing a plethora of experiences. Maturity is not gained via osmosis, nor by simply knowing people who are mature. In order to become mature a person has to actively learn from the things they experience in life, as well as from the experiences of others. And not only does a person have to learn from their experiences and those of others, but they also have to apply the things that they learn to future situations and use the acquired knowledge to make better decisions. This is what separates the mature from the immature.